Holidays are no longer just some time spent by having fun and simply resting. Due to the hasty life pace, people are turning to vacations that are favorable for their health, both physical and mental. And as a country that covers an entire continent, Australia is rich with beautiful nature, urban cities and rural landscapes, where you can find wealth of pampering options. Eastern shore of the continent is especially filled with spa resorts and it is becoming a popular choice not only for Australian citizens. Everything from pure pampering, beauty treatments to personal empowerment can be found in Aussie’s spa wonderland. Let’s dive in deeper in the possibilities of such vacation. Put a spa resort in the centre of a concrete jungle and it won’t work as it should. But place it in the middle of astonishing nature, surrounded by ancient plants and rare wildlife and the results will be amazing. With more than 500 national parks and 15 wonders on the list of World Heritage, Australia is a paradise for nature-lovers. Just the sight of these beautiful landscapes is a cure for itself. By simply breathing in clean mountain air you can consider yourself on a therapy. Mineral water springs can be used for the same purposes and the salty water of the see is helping your immune system and facilitating the circulation of blood in your body. Rare animals inhabiting Australian continent can make your holiday far more pleasant experience. Koalas, kangaroos, sea lions, pelicans, penguins and wallabies are a delightful sight putting a smile on a beholder’s face. Besides, it is thought that socializing with friendly animals is a natural stress reliever. If needed, some centres are offering possibilities of animal therapy, which includes horse riding or farm visiting. Horseback riding is proven to be beneficial for social, physical and emotional well-being of a person. Spa resorts in Australia range from natural hot mineral springs to medical spas, from vineyard surrounded resorts to relaxation day spas, and more. There is a resort for everyone, for people seeking mental health retreat and for the ones who simply wish to take a day off and enjoy traditional aboriginal massage. There are even yoga resorts. Some eco-friendly spots are based on re-connection of man and nature, and there are some rituals as tree-planting ceremony. Wellness experiences include various massages, stress managements, organic cuisine, naturopathy, facials, water-based therapy, steam and sauna rooms, mud treatments, etc. For those more active, depending on the resort you choose, you can spend your time doing tai-chi, playing tennis or taking self-defence lessons. You can’t go wrong when it comes to pampering in Australia, all the resorts are top-notch. You can do your own research, but we’ll mention some of the most interesting places. Chuan Spa in Melbourne embraced traditional Chinese medicine, and interior is adapted to their spa mantra. Living Valley Springs set among green hills 30 minutes from Noosa, away from the city noise, is giving you a chance to design your own health package based on your needs. 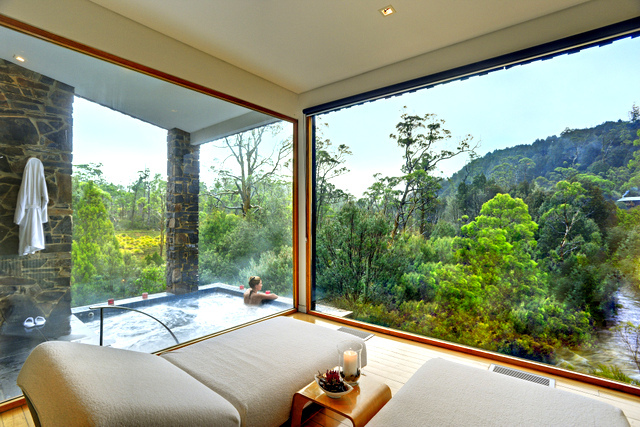 Emirates Wolgan Valley Resort and Spa located in the greater Blue Mountains, near Sydney, is a true eco-friendly resort, where you can find cuisine based on local seasonal organic products. Famous for its stress management programs, Gwinganna Lifestyle Retreat in Tallebudgera has a dedicated team that takes care of each guest individually. We could go on and on like this, but try to find a retreat based on your needs and location that suits you the best. There is no need for more talking, now it’s time for some action. It is certain that Australia is perfect for healthy holiday. The only thing you don’t know yet, is which corner of it will be your choice for relaxation, health improvement or stress relief. About the Author: Marie Nieves, student of economics who loves unusual trips and have a plan to travel the whole world. She has always loved to travel, and she loves to talk about her experiences. On her travels she likes to read poetry and prose and loves to surf the Internet. An avid lover of photography and regular author on High Style Life. You can find Marie on Facebook or follow her on Twitter and G+.